Lisa Notes: Should we clap “in church”? Should we clap “in church”? Should we laugh together? Should we ever cry? Should we be quiet when someone else is talking? Should we sing “Up from the Grave” a little louder on the chorus? Should we “Be Still and Know"? Should we “Stand Up, Stand Up for Jesus”? Should we be authentically human, reverently humbled, gratefully enthusiastic before the God of our salvation? Should we even have to ask these questions? All week long we see so much trouble in the world. Drunk drivers killing our friends. Thieves breaking into our cars. Kids growing up too fast. Affairs scheduled after work. The bad guys can appear to be winning the game. So when we gather with other believers, the ones who still don’t have it all together but who at least want to, we need to lock arms and pray and sing and worship and celebrate our connection with each other and with the Father. And when we share our stories about one of the good guys scoring a touchdown, is that a time to shush each other? Are we commanded to maintain silence in the end zone? Ever done that at a football game? Of course not! Let’s trumpet our victories! Let’s cheer on the team! Who better to celebrate with than the family, and what better time than when we’re together? We were not created to be closet worshipers or silent celebrators. Give up some joyful noise. If anybody deserves applause, isn’t it the Lord? If the seas are commanded to roar yet have no voices, and the rivers are commanded to clap yet have no hands, and the hills are commanded to sing yet have no songs, surely, surely we can do the same with the gifts we have been given—we who have been given voices and hands and songs that we might declare his praise. Should we clap with the church? Yes. Wouldn’t it be disrespectful not to? I applaud you and your blog! If we can applaud at professional ball games, and musical concerts, then why oh why can't we clap for Christ? Great blog! when we clap our hands after someone sings for The Lord, who are we giving glory to? God or the person singing? Anonymous: That's a great question and a valid one to ask. Each person has to answer it in his own heart. As for me, I hope my answer is always: "God!" Oh, yes, Hallelujah! To Anonymous: Are we clapping for God or the person singing? The answer is--yes. And the glory is all God's--the God who gave the singer or player his or her gift, and told him or her to share it, to build up the Body of Christ. We are human. We experience the world through our senses. We interact with it through our emotions. If we close them off in the name of reverence, we are turning our back on the God who drank wine and told witty parables and ate with sinners. Reverence is important, but reverence isn't necessarily silent, or serene. Some thoughts from a classically-trained music liturgist. Supporting how you worship God under the new law by using text from the old law is dangerous at best. Worship is not about you celebrating touchdowns because its actually not for you at all. Worship is for and to the Lord. So if its not about us and entertaining us and keeping us happily involved in church then.... We have to look at how God has asked us to worship Him not how we think he wants to be worshiped. Thanks for praying for me. Always needed and appreciated. I definitely want to worship God in spirit and in truth, under New Covenant grace, not Old Covenant laws. I also appreciate you sharing your thoughts. I've been hearing and studying the arguments you mentioned my entire life so I’m very familiar with them. But I continue to find those arguments empty. I find no Biblical commands, examples, or inferences that wouldn’t allow clapping, nor do I find any that wouldn’t allow song books or pews or plastic communion cups or many other things we use in our worship of God. There are no commands, examples, or inferences for those things either, but that doesn’t make them wrong. And if I don’t celebrate God more than anything else in the world, I should celebrate nothing. He is the most worthy of ALL celebration with ALL of my being, even my hands that he made for his glory. I pray that you are also able to celebrate his love for you, his grace for you, and his salvation of you, and worship him with your heart, soul, mind, and strength. Perhaps you’ve never been moved to tears by his love or felt such joy at a baptism that you spontaneously clap or know the peace that comes from being confident in your salvation. May you soon learn to delight in the Lord and honor him with your whole life! So the question is, do we go to church to worship or to be entertained? Mark 2:27 And he said unto them. The sabbath was made for man, and not man for the sabbath. Angie in GA: I'd love to worship with you! Anonymous of Dec 9: You've posed a great question, and an easy one to answer: we meet with the church to WORSHIP, and to encourage each other to worship, NOT to be entertained. We agree, yes? All our life should be about worshiping the Lord. Yes, thank God we have prayer. Worship him there, too. "All scripture is given by inspiration of God, and is profitable for doctrine, for reproof, for correction, for instrction in righteousness:"
Jesus never corrects or changes or rejects the old testement commandment to clap you hand, so it stands as an instruction still for the church. Thanks for letting me share my little bit of words..
Angie in GA, my problem with this whole thing... I'd be concentrating on you, not God. Have you ever thought that exercising your freedoms might be distracting to others around you? I don't mean to be harsh. I'm not sure how to answer your question of "why don't we clap after someone prays?". You make a very valid point. We do all have to be considerate of each other. And thankfully that works both ways. Just as the expressive believer needs to not be too distracting, so the non-expressive believer doesn't need to put unnecessary prohibitions on others. I think there's plenty of room for all believers who truly worship the Lord to find middle ground so they can worship Him together. And you didn't come across harsh at all. I appreciate that and I'm sure Angie of GA would, too. I think what we should ought to do is respect each other's opinion and right. Clapping of hands anyway is not sinning. When someone wants to clap his/her hands let him do so. In doing this we are building relationship with each other. God wanted us to love one another. He loves us and made us unique individual. Relationship with God and others is still the best. And that made us all complete. The act of clapping in church for a good song or something else is problematic for a few reasons. First off, clapping is a signal of approval. God is NOT subject to our personal approval. We are HIS servants. He is NOT our servant. We do not have to like what He does for his own reasons. It is not up to us to feel good about His ways and His time. Does not clapping signify our disapproval? I say that it does IF clapping signifies approval. To me it has more, though, to do with the particular style of worship that your church partakes in. If your church is one where people are mostly silent, then I say you need to find another congregation in which to clap. You need to in like company. Why force your ways on others who may not be comfortable with them? Thanks for the comment. It’s good to hear differing opinions. I’d say we pretty much agree: God never needs our approval, but he does command and deserve our praise. And because in many places there are different churches around who offer variety, it’s probably more comfortable to find one that suits “our” individual style of praise. However, isn’t it a sweet sign of godly unity to be in a congregation that has ALL kinds of styles, and yet still be able to worship together in harmony? Our standards for “like company” should be centered on a common faith in Jesus instead of whether we clap or not. Also, not everyone has the choice (nor chooses to take the option) to church shop just to stay in a comfort zone. I think the Lord is pleased when we choose to stay together and work through our differences instead of abandoning ship when a non-salvation difference arises. Christianity is not about what you know but wait God has said through his word which is the Bible, It's olso not about wat we want to do because we want to please God but about wat God wants us to do. Seriously speaking, in the Sinagoge, clapping? Where in the Bible does it say you should be clapping. He who seeks salvation is in trouble and doesn't need celebration. But once the man in trouble has received salvation, he indeed has reason to celebrate! Be joyful if you know Christ! The Bible is full not only of God's approval of, but also of God's commands to celebrate. Please look up all the feasts and the special days and the joyous times of celebration initiated by God Himself through the Bible. Perhaps clapping is not the way you personally choose to celebrate good news. No problem. But however you celebrate, I hope you do celebrate God's grace. No, we should not. Why? That's easy. 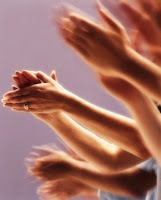 There is NO evidence in the New Testament that clapping is or was a component of worship. Second, do we really want to reduce our worship to the level of a ball game or a Led Zeppelin concert? Is that really the level we attribute to the God who loves us unconditionally and paid the ultimate cost for us on the cross? Church should never be viewed as entertainment, and clapping is what you do when you're entertained. There is also the issue with the very definition of clapping---it signifies approval. Does that mean when we don't clap, we don't approve? Who appointed mankind the right to approve what God has or hasn't done? We are accountable to God, not the other way around. It is not up to us to approve what the preacher says in the sermon. What if the preacher says something we don't want to do or that we don't agree with? I appreciate you sharing your views, even though I respectfully disagree with them. Yet another reason we all are in need of grace. What we do agree on though is the most important thing: that God loves us unconditionally and paid the ultimate cost on the cross. It's fine if you don't choose to clap for that. And it's fine if I can't help but clap for that. God is awesome.